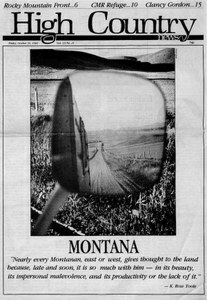 A special issue on Montana, with articles on the Rocky Mountain Front, the Charles M. Russell National Wildlife Refuge, cattle and coal, and Anaconda's bars. The Rocky Mountain Front's Pine Butte Swamp, an area facing oil development, is the last place in the contiguous United States where grizzly bears come down from the mountains to forage in the lowlands. Livestock grazing and wildlife clash in the U.S. Fish and Wildlife Service's management plan for the Charles M. Russell National Wildlife Refuge. As long as we have the federal government in our front yard, we will attempt to work with them to arrive at decisions that are mutually beneficial to Montanans and to the nation as a whole. A small community navigates the challenges posed by enthusiastic bear-watchers.